Product prices and availability are accurate as of 2019-04-13 21:23:45 EDT and are subject to change. Any price and availability information displayed on http://www.amazon.com/ at the time of purchase will apply to the purchase of this product. 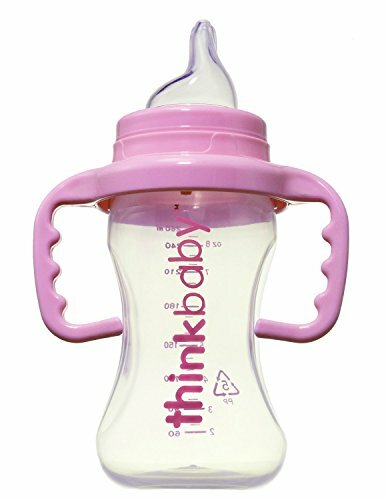 The thinkbaby Sippy Cups have soft silicone spouts that make for easy transition from baby bottles to sippy cups. This is a struggle that most parents face in moving to the next stage of feeding. With the thinkbaby Sippy Cup, the little one is already used to the feeling of silicone so making the transition is quite simple. The spouts also feature a cross cut design so they do not spill when held upside down, which obviously happens quite often. There are also next extra little pieces to lose or clean. The Sippy Cups are made from No. 5 plastic and therefore can be recycled after use.